The map shows the world featured in my upcoming fantasy novel "The Exile" (the first installment in a larger series that will eventually come to be called "Chronicles of the War of Blood and Darkness"). It depicts the civilised lands of Ilan, Gaendyr, Faltorn and Araniell, and the sparsely inhabited outer reaches of the Nargwin Coast, the Svariin Waste and the Nomad Lands of Hamadion. It's not the first time I tried to turn this fictional world of mine into a map. You can find an older version here. That map, however, was completely unsuitable for print due to its colourful nature and the crazy level of detail. It's the perfect reference work for when I'm writing though, so I didn't worry too much about it. However. Recently my sweet wife started urging me on to get the work to a publisher. Partly because she's wonderful and wants to see me shine, partly because the extra income is always welcome - she's always been the more practical one. So I kneaded the manuscript in something of an acceptable form and started doing the rounds past some publishers. And lo and behold, I actually found one interested! 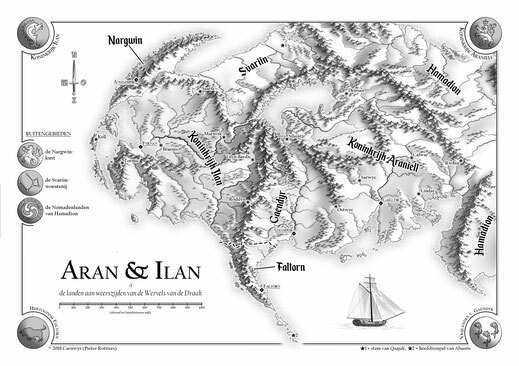 So this map is created to be featured in the book. It's smaller, purely black-and-white and far less detailed, but it should still get the message across nicely. A second map zooms in on the most important region: the Dragon's Backbone.